This game has been on my radar ever since I saw the first reveal trailer in November of 2017. It stands out in the currently busy dino park management genre due to it's lighter take on the game. Not only does it use a 'traditional' grid based system and camera, it has some interesting and fun mechanics in it too. The way you design your exhibits will determine how your 'dino best friends' feel about them, is there enough space or is it even the correct biome? You can also affect the traits of your dinos with accessories such as a unicorn horns, hot dog hats and the infamous cone of shame! Until the game comes out and we get 'hands-on' we just have to work from the few videos on the developers Youtube but they have shown us a few of the different aspects. 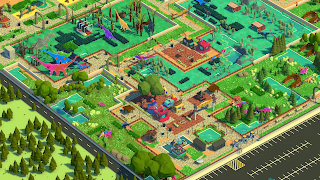 From exhibit design, taking into account the environmental and privacy needs of your dinos, to dinosaur breakouts, where they wreak havoc in your park destroying not only fences, but your shops too. The game look like it's going to be extremely fun. In addition to making your exhibits, you also need to serve your guests and keep them happy. 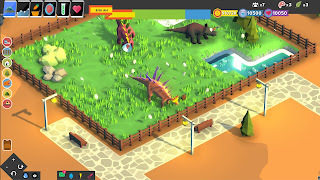 By making your guests happier they will spend more in your shops and stalls and might even decide they want to contribute to the welfare of your dinos by making a donation in a strategically placed donation box. 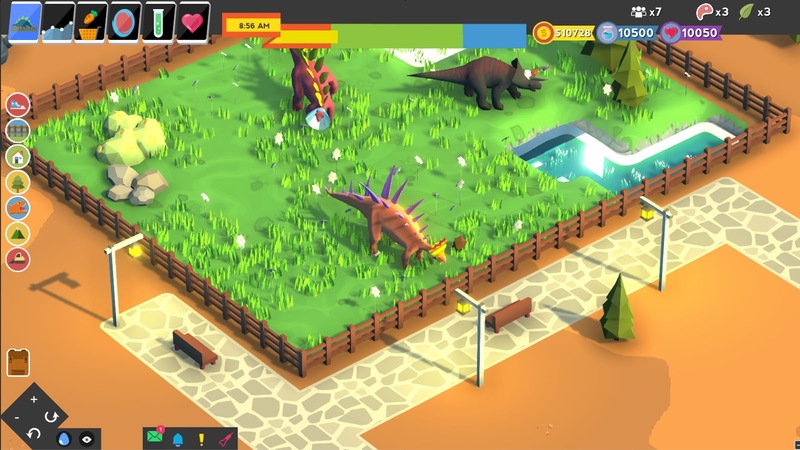 Other confirmed features include staff management/training, time travel to collect eggs to expand your collection of dinos and seasons, each bringing their own challenges. Over the past 9 months you can see that the devs have made some great progress in the new trailer (below) with completely new guest models and Dino shaders making everything look less ''blocky". They have been fairly active over on their Discord server, regularly sharing concepts and asking for feedback, and at at times implementing that feedback. I've barely scratched the surface in this brief post but expect more content and details once the game hits Steam next month and there is more information in the devblogs. The game is developed by Canadian devs WashBear Studio, a team of two developers, and will be their first game, although both members of the team have a number of years in the industry. The game hits Steam Early Access on September 25th and is due to cost $19.99.